The site acts as a showcase for our facilities, capabilities and for the wonderful city of Genoa. 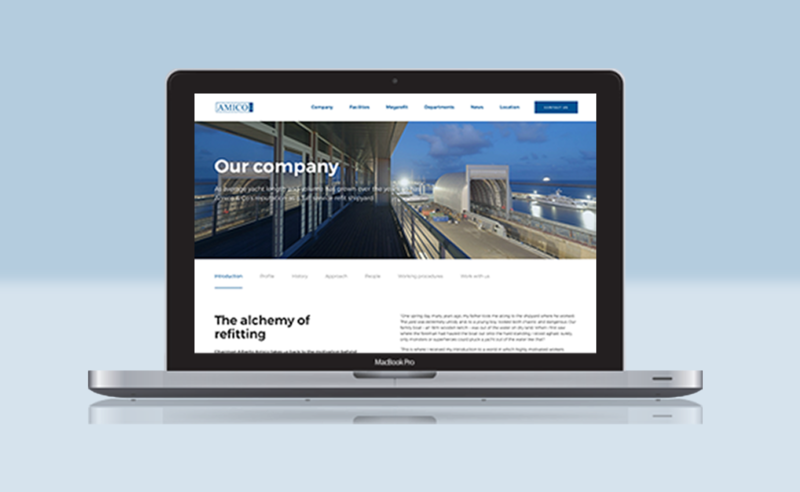 Amico & Co is pleased to announce the launch of its new website. Now fully responsive for all screen sizes, the innovative site offers quick and easy access to all things Amico for clients, partners and the wider yachting industry. Features include improved functionality, a clean design and rich content that mirrors the expertise and focus of the Italian refit specialist. Crew are an important focus for Amico, with a dedicated concierge team helping making time at the yard stress-free and enjoyable. “Being based in the centre of Genoa means the city is very much part of life at the yard,” Di Gampaolo continues. A city map allows visitors to explore how to get the most from their time in the heart of the Italian Riviera. For crew who haven’t visited Amico & Co before, the website showcases not only what Genoa has to offer but also in the wider region of Liguria and has a specifically designed crew guide with essential local information. This latest online presence reinforces the full-service shipyard facilities available at Amico & Co. It will be updated with news and events and it is hoped visitors to the site will enjoy an informative experience.